Engage with 100 customers on autopilot to keep them coming back and spending more through loyalty campaigns. You run a local business (restaurant, salon, retail shop, ...) and have little time to dedicate to digital marketing to promote your business. Maybe you have a website, a Facebook page, the Wifi... and these are all good things to do to capture leads and new customers. Where are the leads going? Your business clients should be able to capture all of these leads and start nurturing them. To convert them into a steady flow of customers, they need Movylo! Leads need to be generated and nurtured to see the real value. Movylo is a growth engine that sends daily messages to customers like birthday wishes, friend referrals, online reviews and even coupons to redeem in store. This results in a steady flow of customers and it’s all automatic with Movylo! Create an account and enter business information. This includes basic details like address, phone number, opening hours, and more. Add or upload the customers. Import customers manually or through Google or Excel and connect social pages. There is also in-store material that can be edited and downloaded to place in the business. If you're helping the business generate leads you can import them into the Movylo account too. And it's just that simple! Activate Movylo, configure it to the business' needs and watch customers walk through the door of your client's business. Why should you sell Movylo? If you’re helping local businesses with their digital marketing, they’re paying you to find new customers. 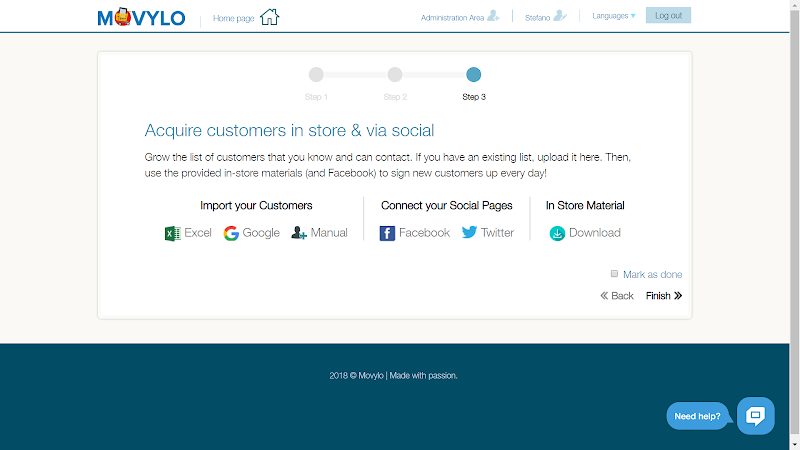 Movylo nurtures leads, sends them relevant and compelling offers, and drives them back to the storefront. These are real and loyal customers! How can I sell Movylo? Create a free report for the business at www.movylo.com/report to understand how much value Movylo can bring to a local business. 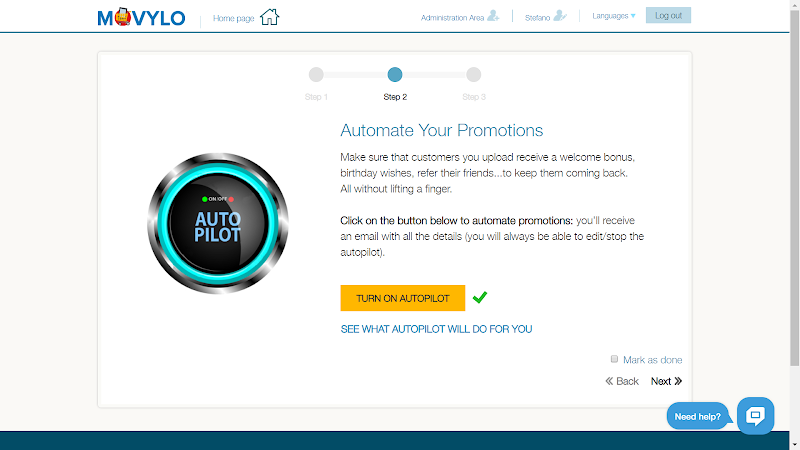 Movylo is not a software tool but an automated service to help get more (and repeat) sales. How easy is Movylo to set up? It’s simple! Once the leads are uploaded the business can tweak the messaging and content (if they want) and once Autopilot is turned on—it’s ready! There is virtually no time required from you or your clients. The full version is up to 1,000 customers and allows you to create custom promotions, your own loyalty program, have a mobile App for the merchant and the customers and a lot more! Why should your agency sell the full version of Movylo? If you're helping local businesses with their digital marketing, it means they're paying you to find them new customers. But after you find a new customer (generate a new lead), your client needs help nurturing them to bring them into the storefront. Movylo does this! Set up an account, turn on Autopilot (our engine that nurtures leads), upload all the leads you've generated for your client and voila! They will start receiving messages and coupons to drive them back into the store. Sell more social campaigns! If your clients can convert your efforts into trackable sales, they will ask for more customers and more leads. A mobile app for merchants to create promotions on the go, validate coupons, assign loyalty points and for customers to manage the loyalty card, see exclusive deals and more. The app is not mandatory for merchants nor their customers. Manage the service for your clients: Help them and see results they get real time. Advertise local businesses at the top of Google’s search page with AdWords.